I read this article and found it very interesting, thought it might be something for you. The article is called I Was the One Who Made It and is located at http://modernloss.com/i-was-the-one-who-made-it/. Still, throughout my childhood, I’d pretend that the babies — now kids, now pre-teens, now teens — had grown up and were simply away, off at camp, over at a friend’s house; not dead, not never coming back, not people who had never really lived. They were so much a part of our existence — so much a part of my birth story — that I found it hard to believe that they didn’t exist somewhere. It felt like they were always on the verge of appearing at the door, like Elijah wafting in for his glass of Seder wine at Passover. If only we’d leave the door open long enough. I mapped out where they’d sleep if they came back: Rachel, the oldest, would still have the sunny room facing the street, which she’d share it with my other sister, five years her junior. My older brother, nestled between those two in age, would have his own room (mine, perhaps, which faced the driveway and seemed to be in perpetual shadow). Would I sleep in the back or in the basement? My mother’s study would probably be converted into a bedroom, but the décor would need to change: she was a writer and had a framed “Letter to the Editor” hanging on the wall behind her desk. In a photo that accompanied the note, a woman was smiling and hugging her baby son, and the caption read, “After my miscarriage, one of your articles helped me appreciate what I had rather than what I lost. Now I have even more: another child.” I knew that I, too, was that other child; I was the reason she could write the story at all. In hopes of finding an appropriate spot for everyone in the house, I rearranged our bedrooms, tried out different configurations, but I also understood that had those babies survived, I wouldn’t have slept anywhere, I wouldn’t, in all likelihood, have been conceived. Three months into her pregnancy with me, her fourth, just as the bulge at the center of her frame started giving her away, my mother’s contractions began again, quiet at first, an unwelcome rumble. She was 36. It had been 18 months since the girl baby had died. She put on her nightgown, crawled into bed, and stayed there for the next five months, drinking red wine every night to relax her uterus. My father set up a makeshift table and chairs in the bedroom so my seven-year-old sister could do her homework, eat breakfast and dinner near her mother — an immobile, anxious lump whose body didn’t seem able to hold onto her babies. The story goes he came home from the hospital where he worked as a neurologist, took off his tie and bathed my mother with a sponge in their bed, delicately turning her from side to side, pouring water over her head, her swelling belly, getting the spots between her toes, her soft, useless feet, all of them, waiting. No one ever spoke of faith in our house. My father had a very distant belief in God and even that was almost laughable, an atrophied remnant from his childhood. We talked of medicine, science, psychology, of cause and effect, of reality. We relied on hard evidence, not the unseen. I was the baby who made it not because I was “meant to” — there was no greater architecture at work — but because of a simple anatomical fix. After the second stillbirth, my mother returned to her obstetrician. Placenta abruptio he had written on her chart after the first baby was lost — a very rare condition in which the placenta separates from the uterine wall. The doctor deemed it a fluke. This time he took a closer look. My sister’s complicated birth six years earlier had ripped the inside of my mother’s cervix, he discovered, rendering it too weak to hold onto any baby once it reached a certain weight. When I was a 13-week embryo, he stitched up the gash in a quick, fortifying knot and sent my mother to bed. That tiny barrier kept me snug inside until I arrived five weeks early, five pounds, and unable to swallow. For three weeks, I lived in an incubator in the hospital but I was alive. I was the closest thing to a miracle we had, and I always knew it. When my sister Rachel was in kindergarten, and again when she was in first grade, there were long weeks when she would come home from school with her best friend, Samantha, and find my mother lying in bed pregnant with one baby or another. Other mothers were at work, or out in the world doing things, or busy around the house; Rachel’s was in bed, staving off early contractions and early labor. This was 1974 or 1975, several years before I was born. My mother remembers Marlo Thomas’s “Free to be You and Me” playing on repeat from a record player in the corner of my parents’ bedroom as the girls played. There’s a land that I see where the children are free, my five-year-old sister and Samantha would sing along as the record swung around its axis. Come with me, take my hand, and we’ll live. The second time my parents came home from the hospital empty-handed, Samantha, herself adopted, asked her own parents, Isn’t Rachel good enough for them? By the time I was born, that record — along with photos of my mother innocently pregnant with the babies at the beach, under a willow tree, posing between my father and sister — had been banished to the basement. There are no pictures of my mother pregnant with me. Rationally, I knew that the babies were never going to appear at the door. That’s because of another secret, a covenant we agreed upon collectively, silently: they lived inside me, and surely, inside my sister. You’ve had to make up for three children, my mother would say at odd moments, her fingers running through my hair with a little too much force. Long before I understood what she meant, she would repeat this phrase to me, her voice and eyes betraying a shimmer of regret or guilt, as though she knew it was wrong to feel that way and wrong to tell me so. What a burden! We never wanted to do that to you. At some point, it made sense: their hopes for those two were being passed along, a piled-on list of expectations in my lap. Despite this odd refrain, I always knew that I was enough for them (simply by being alive, by being here at all, I was more than enough). But still, it was as though the two babies had been absorbed into my body. They hadn’t disappeared like conjoined twins in the ether; they weren’t going to magically appear like Elijah. 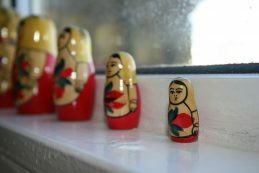 I was living for all three of us, a little Russian doll with another and another inside. Abigail Rasminsky has written for the New York Times, the Cut, Longreads, Lenny, The Washington Post, Marie Claire, and O: The Oprah Magazine, among other publications. She lives in Los Angeles. A version of this article was published in The Morning News. Republished here with permission.